The Wizard (Djimon Hounsou) gives teen Billy Batson (Asher Angel) the ability to fight evil forces as an adult superhero (Zachary Levi). In post-WWII Hamburg, complications arise when a British colonel (Jason Clarke) and his wife (Keira Knightley) occupy the home of a German widower (Alexander Skarsgård). The circus life of a flying baby elephant is depicted in director Tim Burton's live-action re-imagining of Disney's animated classic. The employees risk their lives to protect guests during a terrorist siege at Mumbai's Taj Hotel in this true story. In a coma after falling through ice, John Smith (Marcel Ruiz) miraculously recovers when his faithful mother Joyce (Chrissy Metz) prays loudly over him in this fact-based film. Why didn't Walt Disney produce a sequel to "Fantasia" during his lifetime? This is a question that keeps coming back to me every few years (usually after someone discovers his groundbreaking blend of classical music and animation for the first time). Long after Walt passed away, the studio released "Fantasia 2000" which featured all new segments and the restored Mickey Mouse classic "The Sorcerer's Apprentice" from the original. Although "Fantasia" is still the ultimate marriage of music and animation, it was not Walt's only experiment with that format. After the theatrical release in 1940, Disney was urged to produce similar movies using popular music instead of classical. What followed were two cartoon features that, aside f rom being dated by the pop tunes, are worthy "sequels" to his masterpiece. 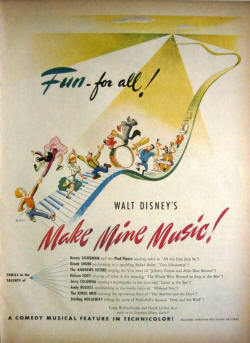 The first, "Make Mine Music" (released in 1946), was billed as "A Music Fantasy in Ten Parts". It included ten shorts, ranging from the hillbilly family feud of "The Martins and the Coys" to the story of Willie - "The Whale Who Wanted to Sing at the Met". Many recording artists of the day lent their talents to this production. Dinah Shore sings about "Two Silhouettes", The Andrews Sisters harmonize on "Johnnie Fedora and Alice Bluebonnet" and Nelson Eddy provides operatic vocals for Willie. Benny Goodman and his Orchestra take on double duty with "All the Cats Join In" and "After You've Gone". Recognizable Disney voices Jerry Colonna and Sterling Holloway can be heard narrating "Casey at the Bat" and Prokofiev's orchestral "Peter and the Wolf". "Blue Bayou", whose animation was originally intended to be used in "Fantasia" as Debussy's "Clair de Lune", and a ballad of lost love "Without You" round out this tuneful cartoon feature. While "Make Mine Music" has been in circulation for years on DVD, it is not intact. "The Martins and the Coys" segment is missing. The comic gunplay and violence were deemed not suitable for children. Sadly, we are left with "Nine Parts". Disney's last musical kaleidoscope was "Melody Time", released in 1948. Its seven sequences are introduced by the voice of Buddy Clark, seen only in the opening as a cartoon mask painted by an animated brush after the sheet-music titles. Like "Make Mine Music", popular 1940s singers and musicians are again present on the soundtrack. Frances Langford starts things off singing the tale of young lovers in "Once Upon a Wintertime". Roy Rogers and the Sons of the Pioneers end the film with the sad story of "Pecos Bill". In between are Freddy Martin and his Orchestra with a jazzy "Bumble Boogie", Dennis Day with "The Legend of Johnny Appleseed", The Andrews Sisters return for "Little Toot" about a small tugboat and Fred Waring and the Pennsylvanians bring Joyce Kilmer's poem "Trees" to lyrical life. Filling out this delightful film is organist Ethel Smith and The Dinning Sisters with a musical romp, "Blame It on the Samba", featuring Donald Duck and José Carioca. 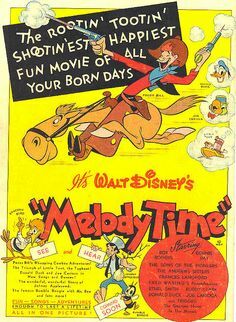 "Melody Time" has been available for quite a while on DVD, but is also not intact. All seven pieces are included, except for a scene with Pecos Bill smoking while wrestling with a tornado. The song is all but ruined by some choppy edits. Segments from both movies have been released over the years as theatrical shorts, have appeared on Disney's various television series and in home video compilations. In the early days of The Disney Channel on cable, both features were shown in their entirety - complete with all of the offensive material. I sincerely wish that the studio would someday restore these fabulous films to their unedited glory on Blu-ray (with a disclaimer if necessary). So far, wishing upon a star hasn't helped. Reviews for some of the featured movies by CLIPS series creator, Roger Tennis. Rog is a movie critic, cinema expert and film historian from the Phoenix, AZ area. He is a member of the Broadcast Film Critics Association (Critics Choice Awards), VP of the Phoenix Film Critics Society and has spent more than 30 years behind the camera in the broadcast industry. Films are rated from 1 to 5 cameras, with 5 being excellent. Copyright © 2019 J-R Enterprises, Tempe, AZ. All Rights Reserved.